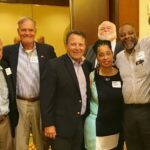 Current and former ruggers associated with the DC area gathered together on October 6-8 for a weekend of rugby festivities. Alumni from GWRFC, Sudamericano, PAC, Maryland Exiles and PERC got together to celebrate over 40 years of rugby in the DC area. Below are summaries of each event along with photo galleries for your enjoyment. Thank you for your participation and stay tuned for additional alumni events in the near future. 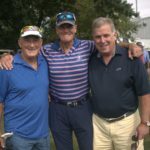 The Rugby Reunion Golf Tourney was held on Friday afternoon at the Reston National Golf Course and attended by 36 Rugby Player/Golfers and consisted of 10 different groups, all competing for 1st Place group play, longest drive and closest to the pin. Lunch and adult beverages were provided before, during, and after the event, which of course always makes for a lively and spirited competition. There were some great and not so great golf shots to be seen by all. We managed to have a fantastic time and didn’t get thrown off the golf course, although the beer cart lady did achieve record sales that afternoon. Officially, the winning team was Reza Amirkhalili, Joe Bellotte, Bill Ogilvie, and John Trauth. Unofficially, the winners were Graeme Tomson, Dean Orbell, Henry Fenauti, and Matt Chalfant. The Tomson group posted a score two strokes lower but unfortunately missed the scorecard submission deadline. A bummer for those guys, but rules are rules and the course management wanted to close the pro shop. The “Longest Drive” and “Closest to the Pin” winners, went unrecorded as many golf tourney participants may have had too much fun between hitting parties at both the Bottom Line and the Front Page later that night! Thank you to all that attended and of course to the organizer John Trauth and his co-chair, Bill Ogilvie for his undying spiritual support! The Rugby reunion committee added something different this year, a cultural tour of the art and artifacts in the Smithsonian Institution, by GW alumni Keith Conway & Ed Staunton, Friday, October 6th, at 3:00pm. The tour group included 24 alumni & their lovely wives starting in the Enid Haupt Garden and then traveled through the historic Smithsonian Castle, “Commons”, Exhibition room. The Castle tour featured selected treasures from all of the major Smithsonian Museums including collections from the African, Hirshorn, Freer/Sachler, (Art museums), Air & Space, Natural & American History were among them. The tour then included riding a giant freight elevator to a preview the Smithsonian National Museum of African Art’s most ambitious project to date, The African Art museum’s exhibition Visionary: Viewpoints on Africa’s Arts, (will open in November). This giant gallery is featuring over 360 works of art, sculptures, paintings, and ceramics. Keith shared the information on projects he worked on through the years in both the Castle & National Museum of African Art, while Ed relayed information and answered questions as well. A special cultural experience was had by all.ell. A special cultural experience was had by all. DC rugby alumni met up on at the Front Page and Bottom Page after the Smithsonian Tour and Golf outing on Friday. Drinks and good times had by all in preparation for the alumni match the following morning. 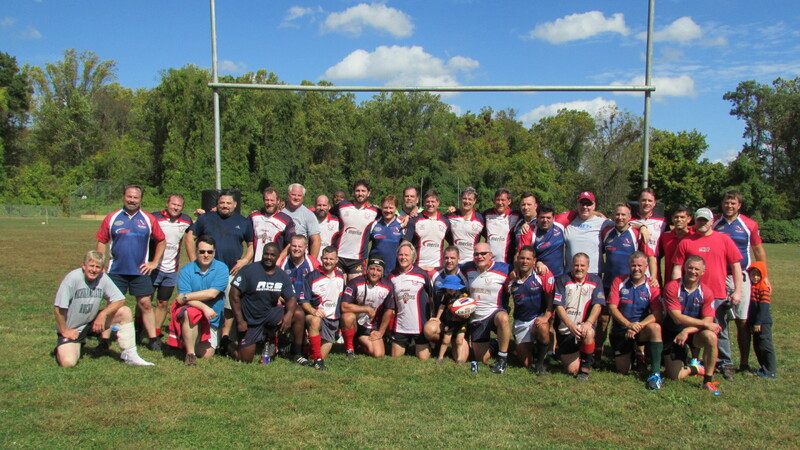 The alumni game preceded the Potomac Exiles league matches vs Baltimore Brumbies. Two sides, picked evenly, competed in three ten minute periods. Surprisingly it was fairly well played considering most players had retired from competitive rugby. The game was even through the first two periods but in the last segment former PAC center, Josh Stallings, was able to touch down twice to make the difference. Also of note: Two former PAC National Championship teammates, Chris Schrichte and John Trauth were influential in the game. The prestigious “Golden Boot” award was given to 70 year old Paul Wolf who succumbed to injury after fielding the opening kickoff! The Georgetown University newspaper, the Hatchet, provided a write up on the alumni match as well. Read more below. Alumni from GWRFC, SUD, PAC and MDX cheered on the Exiles the Division 1 side sported a dominant win over the visiting Baltimore Brumbies. Read more about PERC vs Baltimore here. Special thanks to the alumni for contributing to the fundraising efforts and cheering the club on. On Saturday, October 7th the Key Bridge Marriott hosted 212 attendees for the 50th Reunion. Travelers from as far away as Thailand, Uruguay, and California made the trip. Over 65% brought their wives to make it an even more memorable evening. Food and cocktails galore insured all attendees had a sumptuous feast. Liam Humphrey’s(GW co-founder) graced all with remarks and Paul Wolf recited the entire prose version of “Eskimo Nell”. The banquet ended with a special chorus of songs and continued drinking at the bar till the wee hours.” All who attended raved about the need for another reunion sooner. Planning has already started and is anticipated within the next three years. File is too large to preview. Click the download button to get the file and view (483mb). PERC was truly honored to participate in this event and host alumni at our Baltimore match this past Fall. Ruggers from our founding clubs paved the way for the Potomac Exiles and help create a strong rugby culture in the DC area. We aim to continue that proud tradition and have your continued support. Ed Staunton and Joe Bender for taking the lead in planning and executing the alumni weekend. John Trauth for organizing the Golf Tournament. Keith Conway for personally providing a tour of the Smithsonian. Mike Green and Mike Fabling for organizing and “coaching” the alumni game. All the members of the of the organizing committee which included all the members above along with Patrick Dynes, Jimmy Mcpherson, Manus Cooney, Ben Weidemer, Dave Etches and Michael Minchik. All the 200+ alumni that participated in a fun-filled weekend.